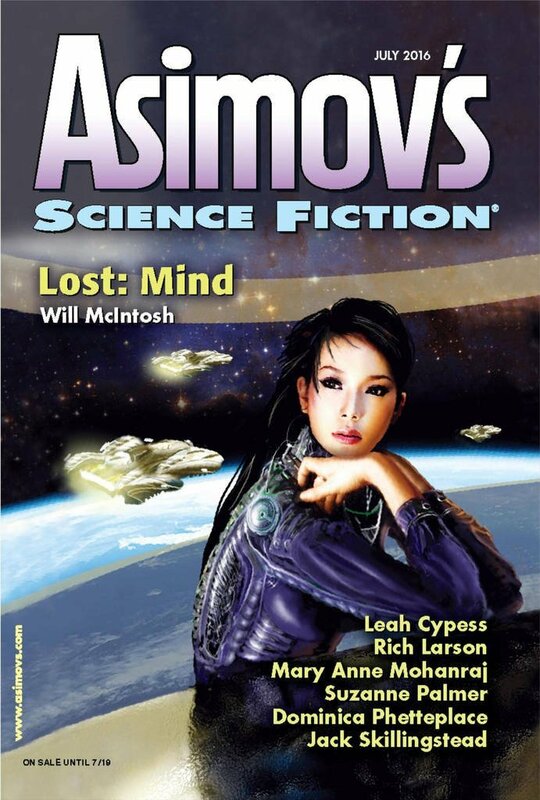 "Ten Poems for the Mossums, One for the Man," by Suzanne Palmer [bio] (edited by Sheila Williams), appeared in Asimov's Science Fiction issue 07|16, published on June 2, 2016 by Penny Publications. Pro: This is the story of how Davin not only discovered that the Mossums were intelligent, but how he came to love them enough to risk his life for them, and, in the process, recovered his creative voice. The various pieces come together nicely. We learn about the danger that the nochers pose, but we don't think of using them as a weapon until Davin does so. We see the Red Rex eat a single Mossum, so we're not surprised when it starts chewing on them wholesale. Best of all, we've watched Davin's slowly growing affection for them, and when he believes they've warned him about the Red Rex, we're not surprised that nothing in the universe is going to stop him from coming to their aid. The people running the project seem to be a sensible bunch, albeit very limited in resources. They mostly stay on the sidelines, where they belong. This story is about Davin vs. his environment, after all. The deeper message seems to be that even though Davin sought solitude, because loneliness is easier to bear if you really are alone, in order to be creative he needed some meaningful contact with others whom he cared for. The mossums are the most unlikely companions imaginable, and yet they turned out to be exactly what he needed. There's probably a pattern in the poems too, but someone else will need to find it. Con: A simple Faraday Cage should have been enough to allow the cottage to have at least a few electrical appliances. This was excellent. Taking the "explore an alien planet's ecology" subgenre and adding a poet rather than the more usual scientist/explorer type really elevates this story. Definitely one of my favorite stories of the year. I rate it ★★★★, one less than RSR. It's a fun story with an uninformed but clever protagonist. My main complaint is that the mossums should not have been a mystery. Either the project people did a poor job of surveying the flora and fauna of the planet before placing non-professionals there, or the protagonist did not do his homework prior to arriving for his long stay. I was unhappy he didn't seem to know the reasons behind the warnings he was given until he experienced some of the dangers. If I had to do his job and was sent to a remote corner of, say, Texas, I'd read up about dangerous plants and animals and weather (such as risk of flash floods in gullies when the rain is in the distance) from Wikipedia or talk to experts and ask plenty of "why" questions. Regarding the "explore an alien planet's ecology" sub-genre, this story pales in comparison to "The Legacy of Heorot" by Niven and Pournelle. Obviously, much more is possible in a novel than a short story, but it was just incredible how the novel got more and more scary as we learned about the samlon and the grendels and the cost to the colony with each discovery. Cameras don't need electricity, right? Why did he have to draw all his findings? The old kind with film (and without flash) didn't have to have batteries, but I don't think anyone has made that kind for a while. Slow start but it got interesting. Like Eric, I did wonder why this guy never asked "WHY" to all the warnings he was given. It also takes a huge amount of effort to chop up firewood with an ax. Some of the more practical aspects of living without technology wasn't shown, or even mentioned.